Today’s weather was rather ok to be honest. No rain and even some sunny parts. I helped a friend moving house and it got quite warm. 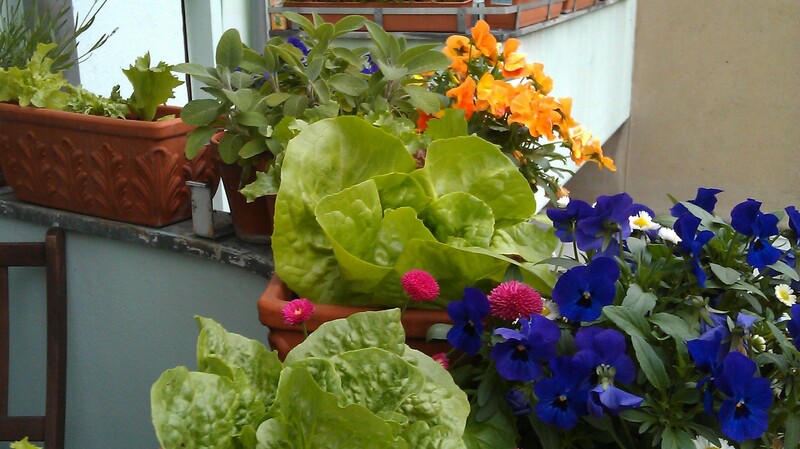 So having been busy in the morning already this afternoon I decided to take the chance of a complete rainfree day to finally get my balcony back in shape: the last radish plants had outgrown their pots. Some of the spring flowers where ready to be thrown out and I had a bunch of petunias waiting to be planted. So I cleaned, I trimmed, I replanted and now my balcony is overflowing with violas and salad that I bought a while ago when they were all super tiny plants and now some of them are huge and they are all different sorts. And now I’m looking forward to, and that might sound pathetic, geeky or even sad to you but rather attractive to me, spending the evening watching episode after episode of Buffy the Vampire Slayer. Yes, I love that show. It is funny, trashy, totally ironic in some episodes and just super cool in a geeky way. I have all seasons on dvd so I could watch a lot actually. Plus I could get the whole ironing done and maybe knit a bit… Yes, I do sound pathetic but in a nice way.